Bikini is a potbellied pig who lives in Denver with her rather large (and unusual) family - she has eight doggie siblings and one very busy human dad. Bikini's dad, Steve, is a big advocate for adoption - and his home is proof. All of his doggie rescues are seniors, making Bikini the youngest member of the family. 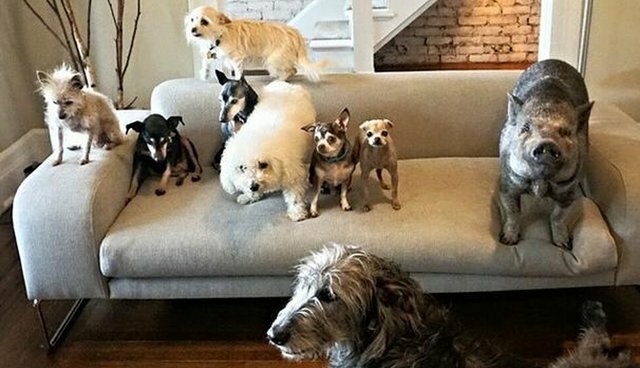 Bikini's dad records day-to-day life with his big adopted family on Instagram, and it's clear that Bikini thinks she's just one of the gang. Bikini and her brothers and sisters keep their dad busy, but having so many four-legged family members around means there's always someone to cuddle with. You can bet that with Bikini and the dogs around, Steve's lap is almost never empty. And when dad's not around, the whole crew has each other to rely on. Bikini may not know it, but she's one lucky piggy.